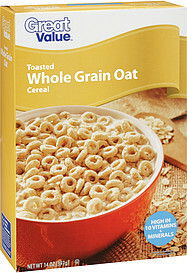 Whole Grain Oat Flour (Includes The Oat Bran), Wheat Starch, Sugar, Modified Cornstarch, Oat Fiber, Salt, Oat Extract, Calcium Carbonate, Dicalcium Phosphate, Tripotassium Phosphate, Iron and Zinc (Mineral Nutrients), Vitamin C (Sodium Ascorbate), Niacinamide, Vitamin E (Mixed Tocopherols) Added to Preserve Freshness, Vitamin A Palmitate, Pyridoxine Hydrochloride (Vitamin B6), Riboflavin (Vitamin B2), Thiamine Mononitrate (Vitamin B1), Folic Acid, Vitamin D, Vitamin B12. Allergy Warning: Contains Wheat. May Contain Traces of Almonds, Pecans, Peanuts and Soy.